Another month has passed and it is time for another Crazy Cooking Challenge sponsored by Tina from Mom’s Crazy Kitchen. It was so much fun last month that I decided that I would have to do it again this month. 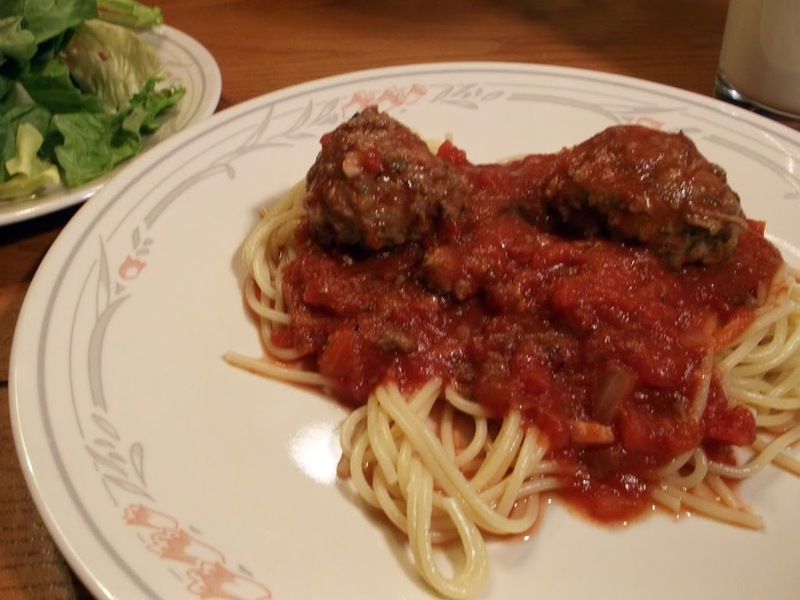 This month the challenge was to find a spaghetti with red sauce recipe, make the recipe then blog about it. The spaghetti sauce had red wine added to the sauce which I have never cooked with wine before, so this was really stepping out of the box for me. Another thing that I loved about this sauce is that you use canned whole tomatoes that are broken up with a potato masher which leaves chunks of tomato in the sauce. Also the meatballs are made with a lean ground beef with a variety of ingredients that leave them so tasty. 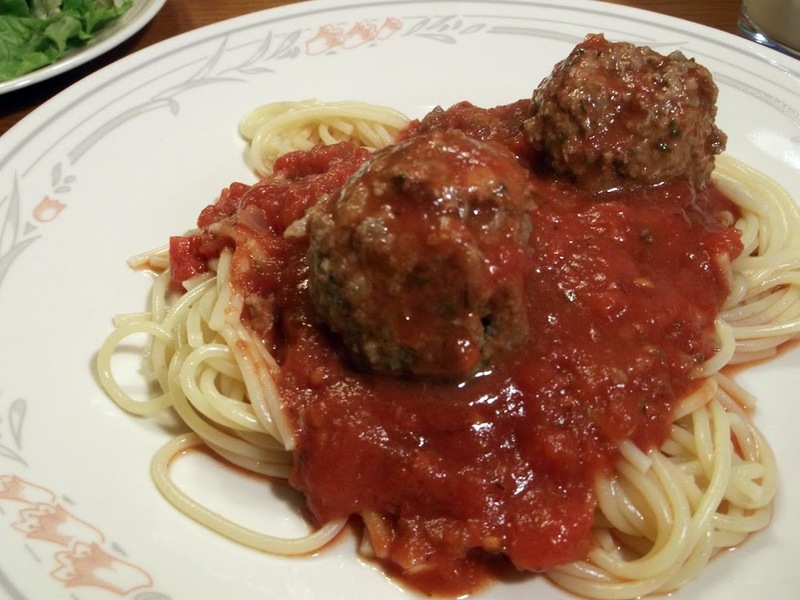 So if you can’t tell by my description of this spaghetti sauce and meat balls, I want to say we loved the spaghetti sauce and I am sure it will not be the last time I make it. So thank you so much Becki for this delicious recipe, my family and I really enjoyed it. Please visit Becki at Becki’s Whole Life; I am sure you will enjoy your visit, as I do each time I stop by. Also I want to thank Tina from Mom’s Crazy Kitchen for sponsoring this cooking challenge again this month. You can also add some grated Parmesan if you would like some more flavor. Gently combine all ingredients and shape into meatballs. Cook on the stove top in a little bit of olive oil until browned on all sides. Drain some of the fat and remove meatballs from the dutch oven to a plate. Cook the onion in the fat that remains in the Dutch oven until translucent. Add the red wine and reduce by almost half. Salt, pepper, dried or fresh herbs and sugar to taste. Add the remaining ingredients to the onion/wine mixture adding only half of the paste at first. Break up the whole tomatoes with a potato masher. As the spaghetti cooks down add more of the paste to your own preference. Add the meatballs back in. Let this simmer ideally one hour (longer is good), but if you have less time, that is fine, too. Serve over hot noodles, if you like Parmesan you can grate some over the top of the spaghetti. If you like more sauce than this you can also add another can of sauce or some more diced tomatoes. If you want your sauce less chunky you process in a blender. It does sound easy and delicious – yum! 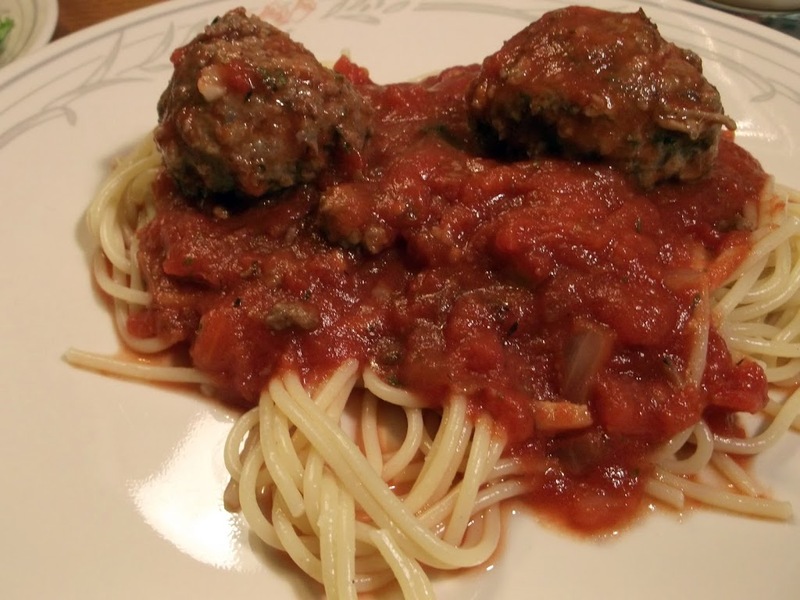 Your meatballs look great on top of spaghetti…love it! Mmm, this looks delicious! My kids love meatballs.